Several weeks ago, I blogged about my adventures and mishaps in trying to convert a script based on my novel Let’s Play Ball into a storyboard at Amazon Studios. My efforts to give my graphic characters realistic wardrobes, props, and settings, and make them behave in ways that fit the story, were challenging and often hilarious. The result was a complete story in 100 panels which actually turned out more streamlined and action-oriented than the book. Still, it takes imagination to envision it as an actual movie. While I was working on this storyboard, I was invited to try an updated application, Amazon Storyteller 2.0 Beta, designed to “help visualize your story in a more compelling way.” I gave this a try for my second project, based on my novel Secretarial Wars. This application has several new features, designed to make the storyboard more closely resemble a movie. The most obvious of these for the viewer is that the panels move automatically without the need to advance them manually. Sometimes, in fact, the panels zip by so fast that the dialogue is hard to read. However, the viewer can pause them if necessary. Better yet, there is also an option to do away with typed dialogue altogether by downloading actual voices reading the script. I didn’t use this device, since I figured it would require real actors and distinct voices to make it work. I don’t have a stable of dramatists on hand, and I’m not enough of one myself to play all the roles! Other available special features include downloaded music and sound effects from the application’s libraries, and the option to download your own. I used the app’s libraries, adding ringing phones for office scenes, honking horns for street scenes, rock music and crashing dishes for nightclub scenes, and a police siren for an arrest scene. The music, especially, adds ambience, although it tends to sound choppy if the same piece extends over more than one panel. Does the new and improved storyteller get me any nearer to putting an actual movie online? A little, maybe. It certainly adds to the fun. For comparison purposes, the links are below. Ever since my Washington Nationals suffered their second early playoff exit in three years, I’ve been in denial that it was really all their fault. Sure, I can point to instances of sheer ineptitude on the field and questionable managing decisions during these playoffs, but it still seems unfair, after twice posting stellar records over the 162-game long haul. So what’s the explanation? Is it a curse or a conspiracy? Everybody knows the baseball gods punish hubris, and that’s how the most famous curses in baseball history have arisen. The Curse of the Bambino started in 1919, when a foolish Red Sox owner sold Babe Ruth to the Yankees to pay off his personal debts. Not until 2004 did the ghost of the Babe relent. The Chicago Cubs have been in a World Series drought since 1945, all because during the World Series that year the Wrigley Field authorities threw a tavern owner and his billy goat out of the stadium. Are the Nats fated to stumble in the same way every time they get within sight of their ultimate goal? What did they do to deserve this fate? True, they have the Curse of Peter Angelos hanging over them, as the dispute over MASN revenues continues. But I’m guessing Angelos has only business and legal clout, not mystical powers. At first I resisted the idea that a conspiracy of umpires was to blame. After all, there are many close calls in every game, especially when it comes to balls and strikes, which are not subject to review and reversal. But the fact remains, this very phenomenon twice kept the Nats from advancing beyond the divisional series in the playoffs. Paranoid as it sounds, this theory has actually been advanced by expert commentators, especially those who are former pitchers. Some have suggested there really is a code among umpires that discourages allowing playoff games to end on a called third strike. In 2012, closer Drew Storen, handed a 7-5 lead against the St. Louis Cardinals in the ninth inning of game five, twice threw pitches that could have ended the game and the series in the Nats’ favor, had the umpire adhered to the same strike zone that he had established earlier in the game. The same thing happened to starting pitcher Jordan Zimmermann in 2014, while trying to close out what would have been a complete-game victory in Game 2 of the divisional series. I’m a purist when it comes to umpires. There should be no “special strike zones” for star pitchers, or floating strike zones for different situations. It’s unprofessional for an umpire to do anything less than his absolute best to maintain the same strike zone for every batter in every situation. So why does this playoff game code exist, if it really does? To me, it’s a sign of cowardice as well as incompetence. 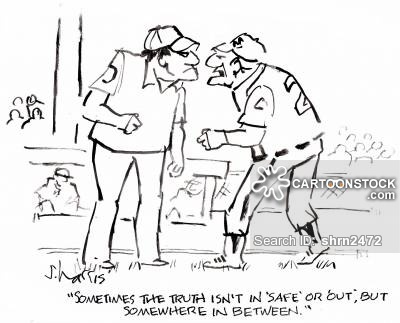 Are umpires afraid to make decisions that are truly decisive?